Ten years ago, Leo Redgate, a lifelong Fairfield resident and local real estate investor, won plaudits when he stepped in to reopen the landmark Community Theatre. Closed in May 2001, the iconic marquee of the downtown move house glowed again when Redgate and the Community Theatre Foundation opened the theater to rave reviews that December. Many patrons reminisced about their visits to the theater -- and its balcony -- as teenagers. Back then, Redgate's first child, a son also named Leo, was an infant. Now that baby is almost 11 and he's been joined by two other siblings. And Redgate's workload now includes coaching the basketball team at Fairfield Prep. "I need to prioritize my life," Redgate told the Fairfield Citizen on Friday. And that prioritization means he wants someone else or sponsoring organization to take over running the theater, which was closed without warning several weeks ago. Redgate says the current closure is temporary, allowing for some renovations. But, he adds, he does not plan to keep running the theater much longer. He wants to see the theater -- an anchor of downtown revitalization -- to stay open, either as a non-profit or profit-making venture. But make no mistake, Redgate added, if someone doesn't step up soon, the Community's screens will go dark. What many may not realize is that Redgate himself was basically was the foundation -- overseeing the high school volunteers who carry theater operations, booking the movies and getting the calls at midnight when something went wrong. He also invested money of his own into the Community Theatre, which costs about $125,000 annually in rent and expenses. "I quite frankly don't have the time or energy to do it the way it needs to be done," Redgate said. "While I have a passion for keeping the theater alive, 10 years is enough." Right now, the theater is closed as renovations take place on the lobby and the projectors, and an ancient phone system is switched to newer equipment. The intent, Redgate said, had been to reopen the theater last Thursday. "But over this past week, I made my decision," he said Friday, a decision that he needs to step away from the Community Film Institute, as the foundation is now known, and the theater. He said any special events scheduled to take place will go on as planned and it is likely the theater will reopen shortly, showing classic films, though the "grace period" for someone else to step in is limited. Redgate is emphatic that his decision is in no way caused by financial woes or tax issues, contrary to some rumors. There were two lawsuits filed against Redgate at the foundation from two film distributors, Sony Pictures and Buena Vista Pictures, but Redgate said both distributors have been paid. Court records indicate a notice of judgment in the Sony case on Sept. 7, and no action in the Buena Vista case since May 24. "There is no issue with the non-profit status," he told the Fairfield Citizen. The foundation has stopped accepting donations, Redgate explained, because "what I don't want to do is to have people give money to put on films for another three months." Redgate said he believes townspeople care about the Community Theatre, but have been content to leave the work of maintaining and running the theater to him. "I think my removing myself is what needs to happen," he said, in order for someone else to take on the role. "I hope 30 people get together and make a go of it," Redgate said. "I'm very confident it will be successful, and I'm happy to assist those people on a limited basis, but I need to step away." The movie theater had operated at the corner of Unquowa and Post roads for 70 years, but it closed with the bankruptcy of Loews Cineplex Entertainment. In the theater's last incarnation, it was named the Loews Community Theater and specialized in screening foreign and independent films. When Redgate took over, a goal of the foundation was incorporating volunteers in all aspects of the theater, such as collecting tickets, handling concession sales and cleaning the premises. Redgate said he never drew a salary through his involvement with the theater. The Community Theatre charged $3 admission when it first opened, which was then half the price of a movie ticket at large chains. It has risen over the years to $5, which Redgate noted is less than half the price of a movie ticket today. 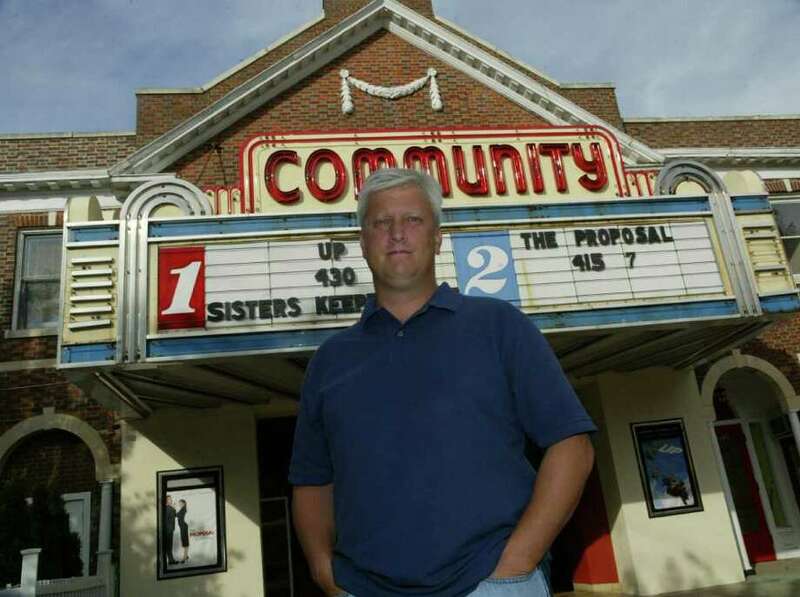 Mark Barnhart, the Fairfield economic development director, said, "The town is very much interested in preserving that venerable landmark and seeing it maintained as a theater at that location." He told the Fairfield Citizen he thinks there is a "role for the town to play in that regard."